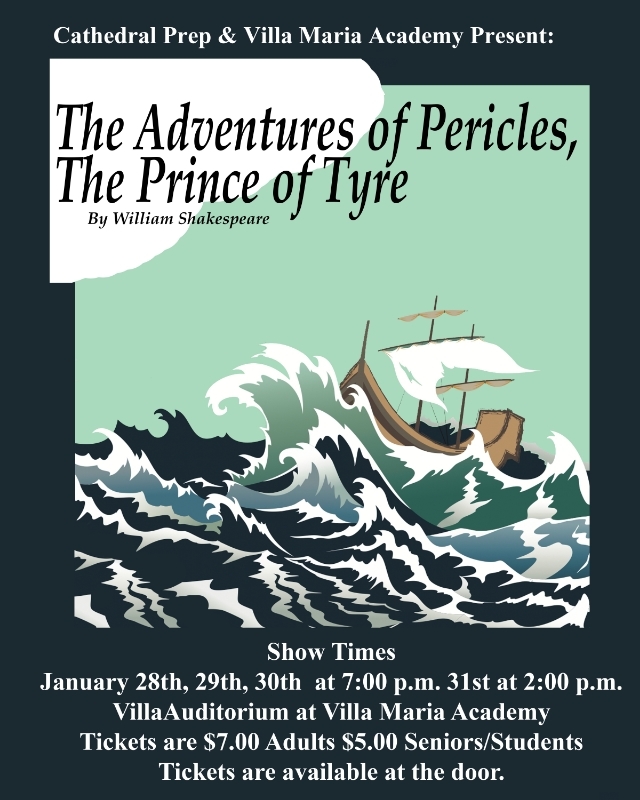 This past weekend, Prep and Villa’s second theatrical production of the year, The Adventures of Pericles, opened on Thursday night and continued to entertain audiences Friday, Saturday, and Sunday. Shakespeare’s Pericles is one of his lesser known plays, but it’s a wonder that it doesn’t come up while discussing his classic works. It’s packed with action like Macbeth, comedy like As You Like It, and romance like Romeo and Juliet. This play isn’t simply a tragedy or comedy; it’s an adventure. As students, one of the best parts of seeing a Prep/Villa show is seeing classmates up on stage. Prep senior John Oehling played Pericles, his first ever lead, and did a fantastic job. Shakespeare’s elevated language makes it difficult to interpret exactly what the characters are saying, but John (as well as the whole cast), made it easy for the audience to understand what was going on with his skilled acting. Pericles is a man who repeatedly has it all, and then has it taken away from him, and Oehling was able to portray his devastation when grieving loss, and his pure joy when once again gaining what was lost. Other standouts in the cast included Alexandra Karlinchak and Case Gryta as Dionyza and Cleon. Dionyza achieves her ill intending goals by manipulating her—for lack of a better word—whipped husband, Cleon. It was also a pleasure to see Jessica Purchase as Cerimon, a ditsy woman who knows how to bring people back from the dead. (This is kind of a plot hole, but Shakespeare and Purchase worked together to make it work). Brendan Flanagan, usually head of audio, made his debut on stage as King Simonides, a king who seeks to set his daughter up with Pericles. “Flans” played the part as such a flamboyant ecstatic father that he surely got big laughs every performance (I know he did when I was there). Also, Seamus Clerkin played a pimp. Just saying. The Prep/Villa theater program’s dynamic duo of director Fr. Mike DeMartinis and choreographer Carolyn McIntyre brought yet another of Shakespeare’s plays to life. They always find ways to modernize plays so that the audience can enjoy Shakespeare, but still keep a Shakespearean feel to them. Two of the best moments, in my opinion, were when a group of knights whipped and nay-nay’d, and when Brooke Kimet actually functioned as the figurehead, or the wooden woman on the front of a ship. From the great directorship, quality acting, and dazzling Steam-Punk costumes, this show is one for the books. Hats off to the cast of Pericles for bringing Shakespeare to life in such an entertaining way.